Evolution in the Church? - READY... SET... QUESTION! Today, the church is crying for unity, but is the cry for unity of truth… or unity of pop-culture. Did God use evolution? Many people think so and they are called theistic evolutionists. The body of Christ has always had to fight for unity of truth when living with the pressures of pop-culture. Healthy churches are thriving today because truth is more important than pop-culture. Followers of Christ are not in a unique time. People like Kenn Gulliksen and John Wimber united around truth that caused a new movement to emerge. The Vineyard church is non-denominational, and is unique and different from other movements. Being different comes about by choosing to branch off. Yet, this type of division is not always a bad thing. Division can be very good if done for the truth of Christ. God has been dividing since the beginning and division is part of His plan when it is taking place for the cause of His truth. But what is considered to be the truth of God? Who get’s to “interpret” His truth? Does each individual get to “interpret” God’s truth how they see fit? Is interpretation of truth reserved for the religious elite and lay folks must follow suit? This is the problem. This is why we have conflict. We all believe our own interpretation is the best representation of God’s truth and this problem is the reason why followers of Christ have created statements of faith. We of the Vineyard are a united group, yet we are divided from other groups because of what we hold to be true. We have created several statements and documents that we are calling the people of the Vineyard to become united around. Our core values are the “DNA” of the Vineyard movement and they need no interpretation. Our values are written in a “centered set, main and plain” kind of way and are easy to understand. One must read our values. Study our values. Be united around our values. If one cannot be united with us, they are causing division, not those who embrace the values. There are many other movements with different statements of faith. Anyone may go and unite with others in a different movement that better matches their personal interpretation of scripture, but we of the Vineyard are sticking to the VINEYARD CORE VALUES & BELIEFS. WHAT IS THE OFFICIAL VINEYARD STANCE ON EVOLUTION? The Vineyard is divided when it comes to evolution. On one hand, we have clearly outlined in our CORE VALUES & BELIEFS, that we humans have original parents, created male and female in the image of God (no mention of evolution), and their sin and/or Adam’s sin brought the judgment of death into the world. “We [at Vineyard Institute] do have a plan to create a course on science and scripture. If and when that comes out, it would position us, in some way, even if we try to tell students that they can choose not to agree with the lectures. Quinton [Howitt D.Th. – Professor of Theology and Education, and also on the Curriculum Committee] and I attended a summit last year where scientists, theologians and leading pastors met for two days. It was set up by an evangelistic organization, due to the concern that views held by some Christians are a barrier to evangelism. IS THE IDEA OF THEISTIC EVOLUTION LOGICALLY SOUND WHEN IT COMES TO BOTH SCIENCE AND THEOLOGY? Before one can make a theological argument for theistic evolution, one must first understand two very important aspects of Darwinian thought. 1 – What is evolution? Unfortunately, there is no scientifically agreed upon definition of biological evolution. Charles Darwin failed to offer a concise definition in his book, On the Origin of Species, by Means of Natural Selection. The Next Generation Science Standards requires the teaching of evolution in public schools, yet has also failed to offer a definition. Major court cases surrounding the creation/evolution conflict have also failed to outline a concise and scientifically agreed upon definition of evolution, but did tell us what science is. In the highly publicized 2005 court case Kitzmiller vs. the Dover Area School District, Intelligent Design/Creationism was officially deemed inappropriate for public school science curricula. The verdict was that Intelligent Design/Creationism is not science because science pertains only to that which can be observed, tested, replicated, and verified. Is biological evolution a form of science that can be observed, tested, replicated, and verified? As previously mentioned, there is no scientifically agreed upon definition, so we do not know if evolution is actual science or not. Yet, Darwin did give a general idea of what evolution is when crafting the title of his book, On the Origin of Species, by Means of Natural Selection. He was clearly communicating that natural selection causes the emergence of new and unique, genetically isolated organisms (species). Ernst Mayr was a well respected ornithologist, taxonomist, and biologist. He is most famous for his part in developing the Biological Species Concept. In 1942, Mayr defined species as “a group of interbreeding natural populations that are reproductively isolated from other such groups.” Mayr’s definition means that organisms that produce viable offspring together are of the same species and organisms that do not produce viable offspring together are of differing species. This definition is currently the accepted standard that biologists use when studying organisms. So, can the emergence of new species by means of natural selection be observed, tested, replicated, and verified? The first thing one must understand before making a theological argument for theistic evolution, is that evolution is not science. Of course there is a mountain of evidence pointing to origins, but this evidence is claimed by evolutionists and creationists alike. All who enter this conversation have the same evidence, but no claims based on said evidence can be substantiated through scientific observation, testing, replication, or verification. I have written extensively on this subject and if you would like to learn more before making an ill-informed argument, read the first three chapters of my book for free. CLICK HERE to receive a sample. 2 – The second element that must be considered before making a theological argument for theistic evolution is that biologists describe evolution very differently then theologians. There are important points that are not agreed upon of which plainly show theistic evolution to be a false representation of the Darwinian processes of biological evolution. Evolution by means of natural selection is just that, natural. Theistic evolution claims evolutionary processes to have been initiated and guided by a supernatural being… yet according to biologists, there is no supernatural element to evolution in anyway. Evolution does not have a pinnacle species nor a goal of any kind. If one could start the process over again, human beings would NOT be the expected outcome. Evolution explained as a natural process would not produce organisms in the image of a supernatural being. According to experts, evolution is constant and no species is immune to evolutionary change. So, humans must have already evolved away from the image of God and/or are evolving into an organism that is NOT in the image of God. Renowned experts in the field of biology view theistic evolution as completely false, for it is by no means a true representation of Darwinian evolution. When it comes to the halls of Academia, it is clear that theistic evolution is illogical, but what about in the halls of theological seminaries? Does the idea of God creating diverse species by means of something faintly similar to Darwinian evolution line up with Judeo-Christian theology? Biologos is a major proponent of theistic evolution and does not see a conflict between Darwinian thought and Judeo-Christian faith. Yet, evolution predicts speciation to occur among groups of organisms, and most definitely not to occur within one generation. This causes a major problem with how theistic evolution views the first man, Adam. If theistic evolution is true, Adam could have never been alone. He would have become the first human by emerging from a group of human-like organisms, yet new species do not emerge in one generation, meaning Adam’s supposed parents must have also been human. So, then was Adam the first human chosen by God from a group of humans to have a relationship with Him? If so, how does this affect the doctrine of original sin and the need for a savior? How did God’s sinless creation become sinful in nature? Biologos understands this issue and has predicted the entrance of sin into the world in a couple of different scenarios. First, Genesis 3 could be symbolic and that Adam never actually existed. The story of the Fall could be an allegorical explanation of sin gradually entering the world. Perhaps the laws that are written on the hearts of mankind needed certain mental capabilities to develop in order for humans to become aware of sin. Second, Adam & Eve could refer to a real couple that were seen as leaders in the early human population. God could have revealed himself to them, given a command to not eat from the tree of knowledge of good and evil, and they chose rebellion. From then, sin could have spread genetically, but sin spreading through social interaction is, according to Biologos, a more likely prediction. 1 – Many scriptures and Jesus Christ himself stated that Adam & Eve actually existed and were not symbolic. Discounting references to Adam & Eve puts the authority of scripture in question and questions the Bible as being a trustworthy document. Discounting scripture and the words/authority of Christ goes against what it means to follow Christ. What is sovereign, the personal “interpretations” of scripture made by theistic evolutionists or the Word of God? 2 – Messianic redemption is only necessary if a connection with God has been broken by sin. If Adam & Eve were chosen out of an existing population, those that were not chosen and their descendants were never given a command by God, of which was never disobeyed, therefore this group never experienced sin. Are there people alive today that do not need a Redeemer? The answer to this question is a resounding no. Romans 3:23 and other verses in both New and Old Testaments state that “all have sinned.” Biologos suggests that family groups in this early population that are not direct descendants of Adam could have acquired sin through social interaction and learned behavior. Yet, this would suggest some peripheral groups to have never come in contact with sin due to the lack of social interaction. This prediction then also suggests the possibility of sinlessness to be spread via social interaction. Do we have the ability to become free from sin via social interaction? The scriptures are very clear in stating that no one is righteous and that we are sinful from the point of conception. The Vineyard is also very clear about our sinful nature for the doctrine of original sin is part of our CORE VALUES & BELIEFS. Biological evolution in itself is a pseudoscience that has failed to be empirically observed, tested, replicated, and verified. Theistic evolution is faintly similar to the idea of biological evolution and is, in fact, rejected by evolutionary biologists. Theistic evolution questions the authority of scripture, discounts the words of Jesus Christ Himself, and in order to be seen as logically/theologically valuable, one must omit a multitude of scriptures breathed by God. Theistic evolution cannot explain the origin of sin and therefore our need for a savior, suggesting some people do not need Messianic redemption in Jesus Christ. Why talk about theistic evolution? Isn’t it “OK” for the Vineyard or any Jesus following “centered set” church to leave it alone? No. The Vineyard Movement has been very honest about what is called the “main and the plain,” and scripture is just that. No one can subscribe to theistic evolution without discounting the authority of scripture and going against what the Bible says. We are a people of the Word and theistic evolution puts the trustworthiness of the Word in question. We are a people committed to God’s plan of reconciliation, but if theistic evolution is true… what are we being reconciled to… and for what reason? When it comes to the foundation of the “main and the plain,” theistic evolution is eroding it away. But could theistic evolution also be a salvation issue? The thief on the cross came to believe in Jesus and joined Him in paradise that very day. Yet, what would have happened if by some amazing turn of events that thief had been set free and somehow survived the bodily harm? Would he have begun to learn and grow in his relationship with Christ? Would he have continued in his wicked ways of using and abusing others by stealing from them? If the thief on the cross somehow lived to a ripe old age, he would have had to have come to a fork in the road. He would have needed to make a hard decision… would he go his own way and continue to steal, or the way of Christ? Could the thief have honestly said he believed Jesus Christ to have been Lord of his life if he committed to a lifestyle of abusing others by stealing from them? This choice is one that truly determines salvation. In similar fashion, if an atheist evolutionist has an encounter with Jesus, and decides to follow Christ… is the evolutionist saved? Yes! Absolutely! Praise God! Much like if the thief on the cross next to Jesus lived a full life, the Christian Evolutionist will have to make choices that are in the posture of following Christ, or in the posture of leaning to their own understanding. If they fail to renew their mind with the mind of Christ and ultimately see the Word of God as second in authority to evolutionary ideas, at that point, their choice is one that determines salvation. A maturing follower of Christ will loosen their grip on evolution, and will have an increasing sense of value for the authority of scripture. Theistic evolution is scientifically and theologically irrational. It is in direct conflict with the doctrine of original sin. Theistic evolution discounts an exhaustive list of scriptures breathed by God. The Vineyard Movement and all Christian churches that value scripture cannot continue (in a state of honesty/integrity) without addressing the issue of theistic evolution in one of two ways. Each community following Jesus Christ must stand firm to their statement of faith, and continue to value the authority of scripture. Subsequently, the endorsement of theistic evolution in churches, seminaries, and the Vineyard Institute will stop. Each community that embraces theistic evolution must be clear in their statement of faith that the authority of personal interpretation is valued over the authority of scripture breathed by God. Subsequently, the doctrine of original sin and the need for Messianic redemption in the person of Jesus Christ will be left open to interpretation. Of which places a church in equal standing with Unitarian Universalist theology. Keep in mind, this is NOT a call to promote hard line creationism. This is a call for the Church to stop teaching the fallacy of theistic evolution. 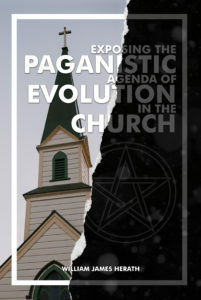 The enemy loves the idea of God using evolution, because it is the first tool to get a Christian church to embrace Unitarian/Universalist/Paganistic theology. The idea of God using evolution, theistic evolution, is proliferating through all of Christendom due to the intentional and methodical efforts of highly funded organizations with an agenda of eradicating the Gospel of Jesus Christ. There is no wonder why the Templeton Foundation has donated millions of dollars to pro-theistic evolutionary institutions, like BioLogos. Sir John Templeton’s foundation is endowed with over three billion dollars and is dedicated to spreading his “open-minded” philosophy of “all roads lead to God.” His approach to spirituality denounces the core teachings of the Bible, and the labeling of Templeton’s philosophy as “open-minded” is just a more socially acceptable way of saying Jesus Christ is false in claiming exclusive access to God. In his book, Possibilities for Over One Hundredfold More Spiritual Information: The Humble Approach in Theology and Science, Templeton outlines his main objective of promoting the Humanistic teachings of the Unity School of Christianity. Although this school sounds like a Christ affirming organization, it is far from being an accurate representation. Templeton’s plan to spread Unity School ideas is by having his foundation support similar thinking entities that pioneer theological ideas having little to no restrictive creeds. The Templeton Foundation has awarded prizes to initiatives that promote non-Christian worldviews like, the Pantheism Project, the Dalai Lama focused Joy Campaign, Planned Parenthood, and of course BioLogos. In fact, BioLogos has received multiple prizes totaling, in upwards of, nine million dollars. Templeton is a self-described iconoclast and his foundation exists in order to attack the supposed close-mindedness of Christianity by promoting an overt agenda of Humanistic Paganism. Including, but not limited to, Unity, Unitarianism, Universalism, Naturalism, Religious Naturalism, and Godless Paganism are all different ways to describe Humanistic Paganism in that they fall under the same theological umbrella. Humanistic Paganism is a religious idea accepted by people searching for a spiritual practice that celebrates the natural world and a supposed deep connection to the Universe while hoping to maintaining their rational faculties. Although no spiritual connection is found and rational logic is ignored, most of those who subscribe to Humanistic Paganism find their place of worship to be in the similar, yet uniquely self-identified Unity or Unitarian Churches. The “main and the plain” of Christianity are at risk. The need for a Redeemer is on the line. Holy scriptures that were once valued and given great authority as words breathed by God are being discounted. We have not been instructed to alter scripture in order to accommodate a secular belief in what we think is most plausible. Every word in scripture is God breathed (2 Timothy 3:16), and every word that we wish had been included, is actually God omitted. This issue runs deep and is the best foothold the enemy has on the Church today. At first, it seems unclear why some Christians choose to divest the authority of scripture in order to maintain their faith in theistic evolution, yet an underlying agenda is present. If the Word of God is able to be “more correctly interpreted” in Genesis, then every book of the Bible is also up for interpretation. If pop culture says evolution is true, then the Bible needs to be “more correctly interpreted” to reflect this new found truth. If pop culture says it is OK to sleep around, then the Bible needs to be “more correctly interpreted” to reflect this new found truth. If pop culture says that our value is based in consumerism, then the Bible needs to be “more correctly interpreted” to reflect this new found truth. If pop culture says _____________ (fill in the blank), then the Bible needs to be “more correctly interpreted” to reflect this new found truth. If we become the “correct interpreters” of God’s Word, what then is the point of God’s Word?